At first glance you may think that these cholla plants are filled with dead bits that are decaying. Not at all! Those many shaggy clumps that you see are all birds' nests. This cacti is particularly great as a nest location because it is quite unwelcoming to any would-be predators. An encounter with a cholla thorn is very painful indeed. It is a neat nesting spot for the birds! Happy 4th of July, have a great weekend! 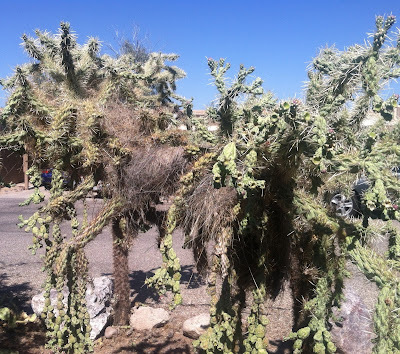 And do we know which type of bird builds nests in the Cholla?